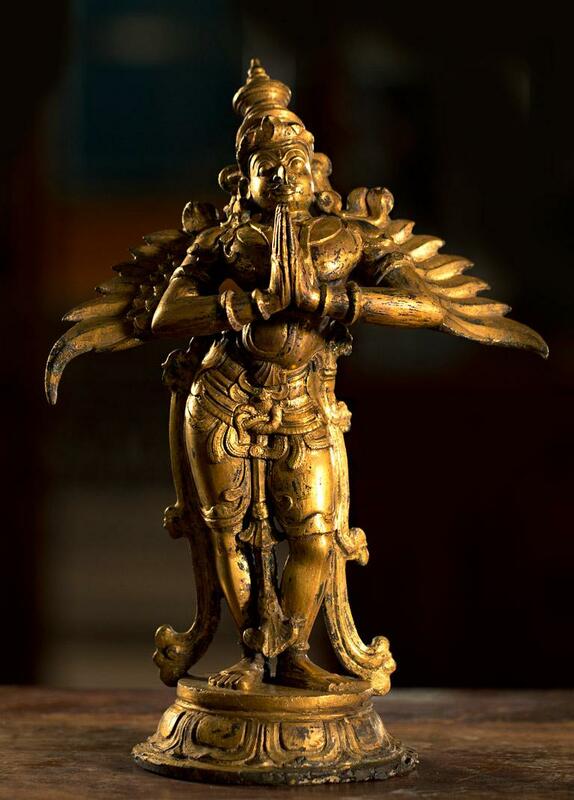 The Garuda is a legendary bird, bird-like creature, or humanoid bird that appears in both Hindu and Buddhist mythology. According to Hindu mythology, Garuda is a Hindu divinity, the mount of Lord Vishnu. Garuda is depicted as having the golden body of a strong man with a white face, red wings, and an eagle's beak and with a crown on his head. This ancient deity was said to be massive, large enough to block the sun. The image is standing in dwibhanga pose. The hands are in anjali pose. The nose is raised and pointed prominently and has wings spread out wide. The headdress and other ornaments are in Kerala style.